I love the smell of summer! Backyard barbecue’s are always a fun time for me. I love just how the grass smells, how the grill smells and hearing the voices of kids having fun. With it being summer time you don’t have to cook indoors everyday. With barbecue outside you can still make healthy dinners by using the grill which will add more flavors to your meats and vegetables. The grill is a great place to make healthy low calorie meals without alot of effort. This is one of my low carb diet friendly meal that you will love. It has a ton of flavor from cooking on the grill and after you do it once you can do it 1000 different ways. This is my basic Beer Can Chicken recipe to get you use to working with a whole chicken on the grill. If you do not like the taste of beer change the beer into a can of Dr. Pepper and it will still give it great flavor. This recipe is easy to put together and then forget about it while it cooks on the grill from the indirect heat. This is also a great recipe to make if you are going to be poolside for a couple of hours. Just put it on and forget about it for 2 to 3 hours. If you are using a charcoal grill you will get that extra smoky flavor to it from the wood chips or charcoal you use. I also put direction on how to cook it in the oven as well on here. The great thing about Beer Can Chicken is if you do not eat all of the chicken you have enough to make you a leftover healthy lunch or dinner. I love pairing the chicken with a fresh garden salad or grilled vegetable kabobs . Hope you enjoy! Slice your orange, lemon and onion into quarters. Smash your cloves of garlic to help release the flavor. Place all items inside the cavity (giblets removed if included) and all the other items in to the cavity of the chicken. On top of the chicken you want to rub under the skin the Mrs. Dash Chicken Grilling Blend seasoning. Also rub on top of the skin as well. Place the 3 piece of bacon on top of the skin and use toothpicks to hold them on. Either drink half the beer or pour half out and add a clove of garlic to it and another Tbsp of Mrs. Dash Chicken Grilling Blend. 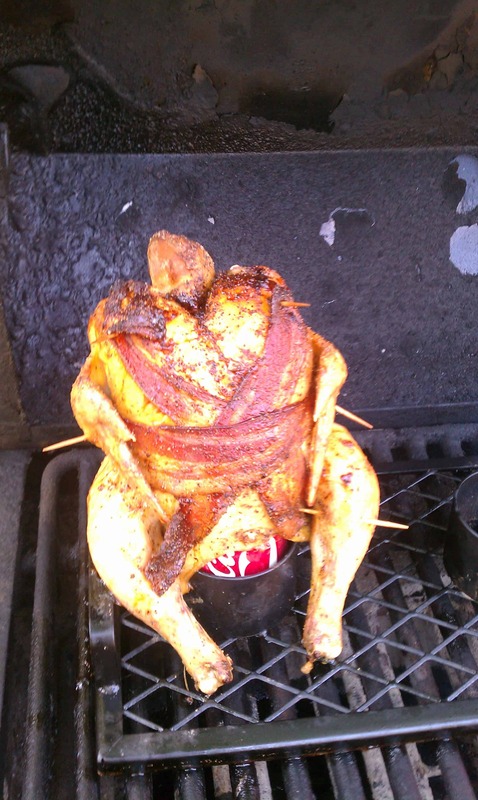 Place the chicken on top of the beer can and make sure the beer goes half way into the cavity. Once the chicken is on the can securely place the chicken into a deep pan to help balance it before either cooking it on the grill or in the stove. A. If you would like to use a grill there are 2 ways to do it. If it’s a gas grill, turn off one burner. If you are using a charcoal grill move the coals to one side. You want to cook the chicken from direct heat so you can do for a long period of time. For the grill you want to cook for 2 hours. Have a small piece of foil with you to place on top of the chicken in case the grill lid is resting on your chicken. B. If you want to cook it in your oven turn it to 325 and place the chicken in for 2.5 hours.